Milo Educational Books & Resources is comprised of school administrators, instructional specialists, and teachers who have joined forces to create much needed material in English and Spanish that targets essential knowledge and skills in Science and Language Arts. It is our goal to provide students, teachers, and parents authentic and appropriate, non-fiction literature with rich vocabulary and colorful photographs and illustrations. 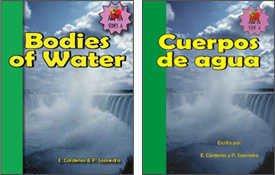 Our books include tables of contents, glossaries, diagrams, maps, and charts. They provide opportunities for cross-curricular connections integrating geography and other social studies concepts while developing literacy and mathematical skills. Students will have opportunities to ask questions, be questioned, and reflect on the information in the text. They will be able to build on their background knowledge by connecting the known to the new. Students will create new meanings and understandings.